Worcestershire Ambassadors are proud to be promoting Worcestershire as a place to live and work. We recognise that there are many other organisations doing the same thing. Many of these are smaller organisations without a major budget. This is where Worcestershire Ambassadors can assist. Using a very simple criteria we assess whether we can help others in promoting Worcestershire. Please note that this sponsorship is outside of the charity donations made by Worcestershire Ambassadors. None of the charity money raised is used for sponsorship. The activity must promote Worcestershire. The activity can be either inside or outside the county. It must be run by a recognised organisation with accounts provided on request. All activities will be based on one-off payments. 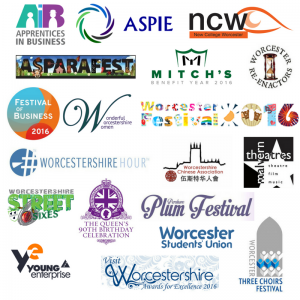 Full and active recognition of Worcestershire Ambassadors sponsorship is required. This is expected to be in the way of our logo on literature (e.g. flyers, media advertising and websites). If applicable we would also like to attend the event with our stand to promote Worcestershire Ambassadors. Must be an “not for profit” organisation. Must not be a Registered /non Registered Charity Maximum award £500. To apply complete embedded application form.